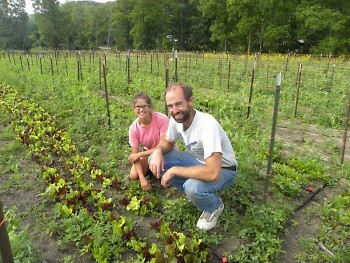 Chad and Heather Anderson grow food and relationships with care at Green Wagon Farm. They specialize in micro greens, a variety of vegetables and herbs. Operated by: Chad and Heather Anderson, with help from voluteers and farm employee Leah Sienkowski. Specializes in: Micro greens, unique vegetable varities, and herbs. Community Shared Agriculture: Offers summer shares from June- October and winter shares through December. Heather Anderson: "Know where your food comes from!" For farmer Chad Anderson, the desire to be a farmer started in 2007, by planting a garden in Uganda. “It all started in the Peace Corp, where I started a garden, just to have some points of conversation with the people because it was an agrarian society. A lot of things were based on agriculture, and I wanted to have the ability to communicate with them and have an appreciation for how they lived,” he says. The garden in Uganda allowed for more than just a connection with other people, by relying on the land not only for food but for culture and livelihood as well. “[The lifestyle is] a connection with the environment and world around you—you were familiar with the seasons. You rose with the sun and set with it. It was a connection with the place you were living,” he says. With no debt or obligations upon his return to the United States in 2009, Anderson wanted to maintain this connection. He decided to work at Groundswell Farm to see if agriculture was something he could keep doing long term. After a season working, farming was an obvious fit. Anderson spoke with family friends about using some of their land in Ada to start a vegetable garden, and Green Wagon Farm was born. Now entering their fourth year of operation, Anderson says that the work is “enjoyable still.” It’s not just that Anderson and his wife Heather Anderson enjoy farming, it’s community members as well. The Green Wagon Farms offers Community Shared Agriculture (CSA) shares, and encourages volunteering at the farm. “I like interacting with people, and seeing how they use the vegetables,” says Heather Anderson. 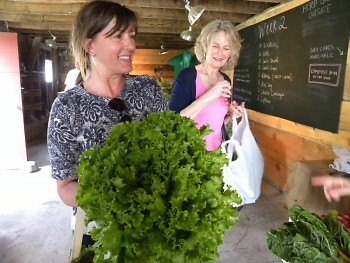 On CSA pick-up day at Green Wagon, customers greet each other warmly, and admire heads of lettuce the size of basketballs. In between re-stocking green garlic and swiss chard, Heather offers up hugs and smiles as well. The summer of 2012, Heather Anderson was about to enter her third year in the nursing program at Calvin. “I didn’t really know what I was doing,” she admits. She decided to work part time, and volunteer at the farm a few days a week. “I’ve always had a passion for food and for cooking, so I figured I may as well start at the beginning with the seeds,” she says. That summer, Chad and Heather Anderson were just beginning to get to know each other, working side by side for sometimes 15 hours a day. After a season of working together, they got engaged in December and married in March. She admits that their relationship happened quickly. “When you’re not paying attention, the right thing comes along,” she says. The Green Wagon Farm has been expanding in other ways as well. “We started on this land, and it had been growing with us, but this year we outgrew it!” says Heather Anderson. Green Wagon Farm now partners with Melody Bee Farms, sharing land and labor. 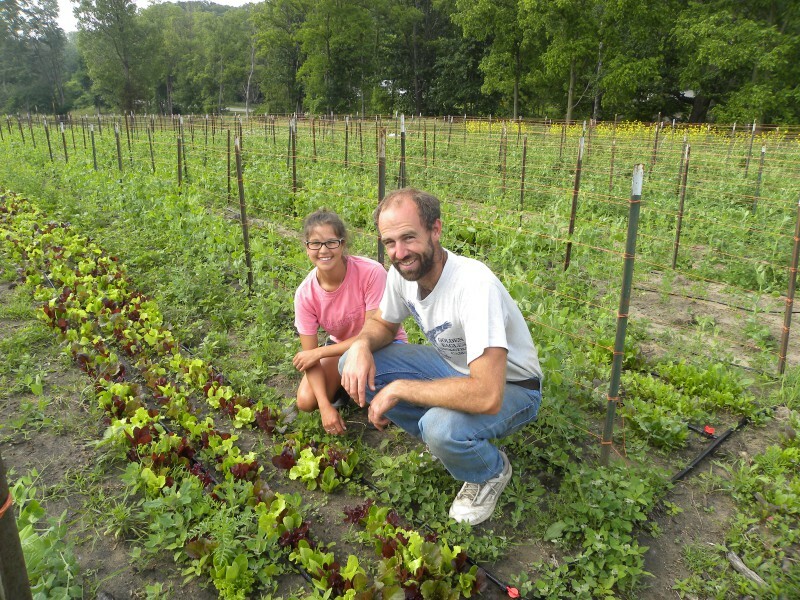 Green Wagon Farm plans to keep sharing their knowledge and passion for growing. Heather Anderson, now enrolled in the Culinary Arts program at Grand Rapids Community College, hopes to use her passion for cooking to teach others in the community. For now, Green Wagon Farm will continue growing food with care. For an inside look at daily life at Green Wagon Farm, check out farm employee Leah Sienkowski's farm blog, or visit the Green Wagon Farm website for more information.